Instead of the sponsorship events and live interviews from Everest base camp in May, the 50th anniversary of the first ascent of Nanga Parbat by mountaineering's unsung hero will go virtually unnoticed. Mount Everest may be the highest point in the world. And Nanga Parbat, conquered just 36 days later is ninth on the list of highest peaks. But the mountain, in northern Pakistan, is known as one of the most treacherous climbs in the world and its death toll is testament to this. After a Herculean 18-hour climb, on July 3, 1953, its Austrian conqueror, Hermann Buhl, legendary for his ability to drive himself through the bleakest of conditions, survived a solitary night just below its summit, staying alive by swallowing stimulant pills to keep awake. It was his strength and mental stamina - developed by death-defying trips in the Alps and the Himalayas - that let him tell his tale. But plans for the golden jubilee anniversary of the climb involving Buhl's widow Eugene have been postponed until September amidst current security concerns in Pakistan. I left the ski-sticks behind and... scrambled up on all fours. Suddenly I realised that I could go no higher. I was on the summit. "A lot of people are not feeling happy about flying at the moment," says Pakistan's premier climber Nazir Sabir - who is co-organising the event. The event was due to follow celebrations surrounding the 50th anniversary of the first ascent of Everest. But route cancellations between Nepal and Pakistan have added to difficulties. It's not all bad news. Many teams are already in place for this year's attempt on Nanga Parbat's steep slopes. "Unlike Everest, it does not have any easy routes up," adds Mr Sabir. "It's a very dangerous mountain and I would say, in many ways, that it's more difficult to climb than Everest." The statistics support this. 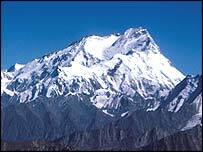 Before 1953, 31 climbers had lost their lives on Nanga Parbat - meaning the naked mountain - including several teams from Austria and Germany. To date, of 186 successful summits, 61 climbers have died - three times higher than Everest's mortality rate. The trip that led to Buhl's success was to be a memorial climb initiated Dr Karl Herrligkoffer in memory of his stepbrother who was killed on an ill-fated Austro-German expedition in 1934. It was yet another tragedy in a series which had beset German climbing teams in their attempts to scale the world's highest mountains. At one o'clock in the morning on July 3, 1953, with his team mate best by difficulties, Buhl set off on a solitary climb from his camp at 6,900m. The rest of the team had descended to base camp over weather warnings. But not Buhl. And by seven o'clock that evening - having traversed a three kilometre long plateau, and defied the complexities of the last 300m - Buhl had clawed his way to the summit. "I now left the ski-sticks behind and - I could do it in no other way - scrambled up on all fours," he was to write in his diary. "Suddenly I realised that I could go no higher. I was on the summit." "I was not, I confess, at the time fully conscious of the significance of that moment, nor did I have any feeling of elation at my victory." Alone, without oxygen, tent, food or water he waited until daybreak to begin his descent. 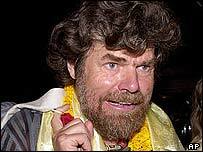 One of the modern day's most renowned mountaineers, Reinhold Messner was to find out just how difficult the challenge was when he ascended Nanga Parbat via its most testing approach - the Rupal face - 17 years later. Nanga Parbat stands at 8126 metres and is renowned for its three towering rock faces - the Rakot, the Diamir and the Rupal - described as the highest precipice in the world. Messner's attempt was successful, but at a painful cost. He staggered into base camp in a state between severe exhaustion and madness knowing his brother Gunther was never coming back. "On Nanga Parbat I understood the reality of my own death," he said in a recent interview with the Observer newspaper. "I had not eaten or drunk anything for days, I was hallucinating, my toes were black from frostbite and my brother was lost in the avalanche." He lost seven toes and some fingertips and for years struggled to come to terms with the death of his brother. In 1978 he returned to Nanga Parbat, reaching its peak single-handed. Messner has subsequently co-edited a book of Hermann Buhl's writings from climbing diaries and mountaineering publications, which portray the climber as a mountaineering professional ahead of his time. Mountaineering wasn't to be kind to Buhl. Four years after his heroic feat he set about climbing the Himalayan Broad Peak and Chogolisa where he fell through a cornice to his death. This week Hermann Buhl's contribution to mountaineering history will pass unmarked. Few know his name. Yet his gripping account of scaling Nanga Parbat has inspired legions of mountaineers in subsequent decades. And to them, the first man to conquer the Naked Mountain is a hero the world has overlooked.